Tales from a Loud Librarian: Information Literacy - Are Librarians Teaching the Skills Students Need? Information Literacy - Are Librarians Teaching the Skills Students Need? 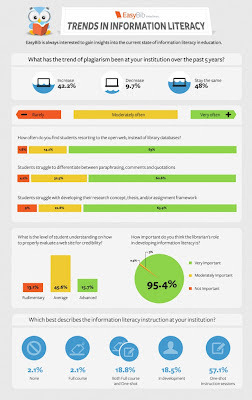 I took a survey with Easybib a few weeks ago about information literacy and what it means for the students at my school. Easybib is what the students at Patrick Taylor use to create citations for research papers. All the answers to the survey were compiled into this cool infographic that gives you a picture of how students are manipulating information and what librarians are trying to do to help them.